UNITED NATIONS: Secretary-General Ban Ki-moon said Friday there is "growing frustration" around the world with Myanmar's ruling generals. He spoke to reporters after emerging from a closed-door meeting during which he spent more than an hour trying to get 14 nations to exert more influence on Myanmar, formerly called Burma. I did read in another paper about how the house-arrested democratically-elected party leader seems to be left by the world, as though allowing the junta just to wait out her mortality. The surprising matter of the UN Chief taking an interest in Myanmar-his UN organizations that did get permission to bring aid into Myanmar earlier this year after a natural weather disaster (though it took a very long time to get in) lost some of their funds due to the foreign exchange rate set by the military. The ruling party made money on those transactions--see Inner City Press for coverage on the money. Myanmar's detained opposition leader, Aung San Suu Kyi, has difficulty eating and has been taking fluids intravenously, her party said Sunday, calling for the military government to allow a doctor to see the Nobel laureate. Suu Kyi, whose nonviolent advocacy for democracy won her the Nobel Peace Prize, is one of the world's most prominent political prisoners, and her release has long been sought by the United Nations and many Western nations. If Ms. Aung had been acknowledged and given her rank as democratically-elected leader, she would not have let the Cyclone Nargis survivors to wait for international aid as long as they did last year under the current government. She also could have ASEAN leaders consider economic development plans for her country that would create jobs while conserving natural resources. The story about the intruder has taken a turn for the worse: Ms. Suu Kyi and her two companions are jailed until her trial on Monday. Expected outcome is guilty. FOR an illegitimate, high-handed and thuggish regime, Myanmar’s junta sometimes displays a bizarre respect for legal niceties. To most observers there never seemed any doubt that, when the current term of house arrest endured by the opposition leader, Aung San Suu Kyi, came to an end later this month, the generals would extend it. However, they seem to have been bothered about possible reaction to this, and to have wanted a pretext. They have come up with one so preposterous they might have been better off simply issuing a decree. 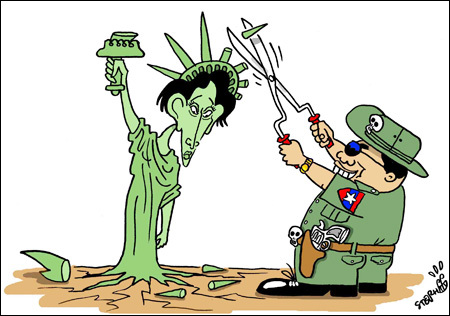 The "Lady Liberty" metaphor suits this situation for Suu Kyi represents democracy to her tired, her hungry, and her struggling citizens. Junta must be using Mugabe as a role model for its roadmap to democracy plan. The UN leader is lost when up against a stubborn leader of that country for so darn long. Basically impossible to get him to think any way other then his way & this has been showen for a maze of years. I would have to say this is pretty well a lost cause upon the UN leader. CHIANG MAI - Last week, Myanmar pro-democracy leader and Nobel Peace Prize laureate Aung San Suu Kyi received an unusual visit from an American man who swam across a lake to visit her tightly guarded residence. The bizarre incident could be viewed as a well-intentioned, but misguided, do-gooder trying to make contact with one of the world's top icons for non-violent struggle. Instead, it has played into the hands of Myanmar's military rulers, who were arguably already looking for a reason to keep Suu Kyi under house arrest, where she has been held since 2003. The hardline regime, rather than simply arrest the trespasser and charge him with violating a secure area, has used the incident to arrest Suu Kyi on charges of receiving guests overnight without informing local authorities, a criminal offense in military-run Myanmar. Nobel Peace Prize laureate Aung San Suu Kyi has been in detention for 13 of the past 19 years. (AP File photo)Burma's pro-democracy leader Aung San Suu Kyi implied in a statement released Wednesday that the country's military government was to blame for a "security breach" related to an American intruder that has landed her in court. "The fact that I am the only party being prosecuted shows the partiality of the prosecution," the Nobel Peace Prize laureate said in the statement, which was submitted to the court in Rangoon Tuesday and released by her political party Wednesday. This woman is nothing less than a living light for democracy in her country. To hope that she has freedom soon, from the onerous jail life that is imposed upon her by the military government, is my wish. HUA HIN, Thailand - When pro-democracy stalwart U Win Tin was unexpectedly freed after 19 years in Yangon's Insein Prison in September 2008, he was then Myanmar's longest-serving political prisoner. Just hours after his release, he was still wearing his blue prison overalls and had already resumed speaking out against the military run government. "I did not accept the terms of your amnesty," he said at the time, referring to the ruling junta's alleged publicity stunt of releasing 9,002 prisoners. "I will keep fighting until the emergence of democracy in this country." HUA HIN, Thailand - Burmese writer and historian Thant Myint-U's first trip to Myanmar (in this interview referred to as Burma) was in 1974, for the funeral of his much-revered grandfather U Thant, former two-term United Nations secretary general from 1961 to 1971. It was an experience that shaped his understanding of the brutality of the military regime that rules the country to this day. When U Thant died, his body, accompanied by the family, was flown to Burma for burial. [Former dictator] Ne Win wanted U Thant buried in a private ceremony; but a convoy of students interrupted the funeral procession, and demanded that U Thant be buried at the site of the former Students' Union, which had been blown up by the military during the 1962 coup. The family was moved by the intensity of feeling but was not sure that a state funeral awarded by the dictatorship would have been appropriate; the Army lost its patience; monks and students were shot; and U Thant was laid to rest in the Cantonment Garden, near the Shwedagon Pagoda, Burma's most important Buddhist site.